Size : 14.0 x 15.9 inches. / 35.6 x 40.3 cm. Description :"Early map, including Odense and the island ""Langeland"". Mercator's sons and grandsons, were all cartographers and made their contributions in various ways to his atlas. Rumold, in particular, was responsible for the complete edition in 1595. 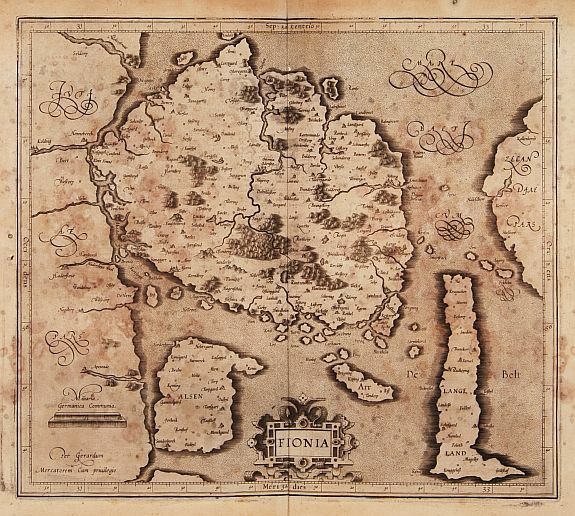 The map plates were bought in 1604 by Jodocus Hondius who, with his sons, Jodocus II and Henricus, published enlarged editions which dominated the map market for the following twenty to thirty years." Condition : Paper browned, as usual. A good and strong impression.